At first glance, An Evening with Eddie Fontana is exactly what it says on the packet; an evening with a ‘celebrity’ TV-show host, aided and abetted by a plethora of co-hosts and guests. This is a well-worn comedy sub-genre which considerably predates Alan Partridge and Ron Burgundy. Back in the 70’s during his hey day, spoofs of popular TV-show hosts such as Hughie Green and Simon Dee were a regular feature on the Benny Show and before. Then at the dawn of Python, John Cleese in a memorable sketch, perfectly satirised the mid-Atlantic voice egotists who filled prime-time Saturday night TV slots on both sides of the pond. And let’s not forget Eric Idle’s Rutland Weekend television from around the same time. Liam Moody has written a show which draws on a wide range of comedy influences as well as confidently playing two very different show guests. An Evening with Eddie Fontana starts off predictably enough with a fast-talking presenter setting out his stall with a lot of self-obsessed ego prior to introducing his first guests and contestants, all of whom being of questionable merits. There are some very funny moments and we see Eddie very in control of events, ridiculing his would-be-celebrity guests for the amusement of the audience. There is real sense of interplay between Eddie and Alan (‘The world’s tallest drawf’), as each attempts to demonstrate they can see right through each other so that a supposedly friendly chat becomes a vicious intellectual battle of egos. Corin Silva as Eddie brings over a sharp-dressed, frenzied presenter determined to overshadow everyone else whilst attempting to remain sober. The plot thickens when the vivacious co-host Brigitte Tenille played with panache by Bethan Suthers, bursts onto the show, making it seem Eddie may have met his match, except for the fact Brigitte seems even more addicted to booze. With the essential dynamics in place, An Evening with Eddie Fontana could have just cruised along, almost as Alan Partidge by another name, but this is not just another chat-show spoof; the hosts in question have personal problems which become all too real as the show goes progressively downhill. The actual presenting alternates between being a valuable jewel to be fought to the death over and a poisoned chalice which gets tossed back and forth. Harry Fitzwilliam–Pipe in his directorial debut takes some daring chances with the pace of the play when fast-moving action increasingly gives way to awkward silences as it becomes clear that not just the show but the lives of the main characters are going steadily out of control. The drama created takes this play well away from being just a farce as raw emotions come to the fore and people are seen to disintegrate before our eyes. Catherine Stobbs plays various different guests, starting with some stock comedy characters but eventually coming on as Frances who is an all too real self-delusional fake, again placing what could just descended into pure farce back into the realms of reality with a tragic/comic twist. Josh Bratherton also plays a varied range of characters with for me, the most entertaining portrayal being an astronomer who has a near nervous breakdown on stage that is worthy of Monty Python. Even the hard-pressed Stage Manager, played by Natalie Jones is seen to go on a real journey as her best attempts to keep everything steadily go awry. 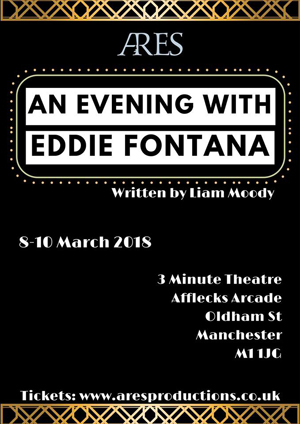 An Evening with Eddie Fontana is an entertaining and enjoyable piece, played by a strong cast which frequently takes off in unexpected directions and is a showcase of vibrant comedy acting. The ending is perhaps a little drawn out, with the action fading away rather than building up to a crescendo but the overall feeling is none the less satisfying. The is a very creditable first full-length production by Ares and indicative of great things to come in the future. An Evening with Eddie Fontana is on until Saturday 10th March.